The recent explosion of collaborative tools on the internet has enabled a large community of amateur genealogists and local historians to connect to each other and share their research which, for the most part, narrates the lives of their own ancestors. The world’s largest genealogy wiki, www.werelate.org, contains over 2 million pages which are devoted to the life of one individual and which can be collaboratively edited by anyone. As editable spaces, wikis are a unique medium in which to record personal history. In my study, I would like to examine how choice of media influences our constructions of our recorded past. Does this process of writing and rewriting our pasts on a wiki mimic oral traditions? Do textual conventions of story ownership interfere with this collective process of remembering? This will be a qualitative study drawing from three sources: 1) my own experiences as a participant in the community, 2) available documentation at the web site, and 3) semi-structured interviews with other genealogists. I think that my hesitation comes from the fact that I am also really drawn towards studying e-democracy and Government 2.0, topics which really inspire me and which have a practical application. Rationalization: looking a Web 2.0 applications in a different context can help you to contextual them in the government setting. OK, my internal devil’s advocate voice is buying this rationalization for the moment. Although maybe I am just struggling because it is April 20, and there is a snow storm raging outside my window. Well, it seems that any skill that I have at genealogy is limited to material that has been digitized and put online. Ha! (Not at all surprising if you know me). One of my most conspicuous dead ends in our family tree was the first wife of Samuel Hird, Catherine Jane Gardner. The genealogist who had done the Hird tree in the 1970s (Lawrence Burness) had clearly found Catherine’s records as he had her birthday and the marriage date for Catherine and Sam. However, as Lawrence once explained to me, the women didn’t matter if they weren’t Hirds. (To be fair to Lawrence, he was from a different generation and he was doing the genealogy work for legal reasons). In any case, Lawrence therefore never entered any information about Catherine’s family onto our tree. I found a nice biography of Robert Sr, which you can look at here. 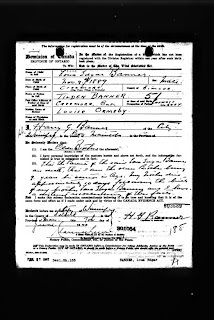 You may also be interested in Edgar Samuel Hird’s baptismal record and Edgar Maxwell Hird’s baptismal record in which he is mistakenly called a daughter. I have also created an album with records for Samuel Hird & fam and EM Hird and fam. I think a lot about McLuhan’s claim that media are extensions of ourselves. Here is my latest insight: hypertextuality is extension of our essentially non-linear thinking patterns. Linear text in type can only go so far. Genealogy is a good example. A genealogical narrative is by no means linear. First, you have two parents, and they have two parents etc. OK, maybe that is still linear in a way. But then you add in elements of place, relationship to historical events, interfamilial marriages, non-familial connections, the connection of two people to one document… You get my point. I also think a lot about how happy I am to live in the age of the internet. This makes me truly geeky, right. No, seriously, I am happy to live in age where every day someone thinks of a new tool to put on the internet to help me extend or reflect my mind. And just to prove my point, here is my latest find: www.mind42.com. I have mapped out my project with this tool and it was shockingly refreshing to be freed from a Microsoft Word outline template. You can see a bigger version of this here. Surprising, I can find a meditative place while endlessly searching Google and databases for the names of my ancestors. And in this place, I have thought a lot about the traces that we leave behind from our lives. The traces aren’t what you would expect and they aren’t something that we necessarily have control over, at least something that the normal mortals among us have control over. Often, our families carve a stone in our honour when we are gone. But the stones get worn and eventually become illegible. Below is the stone of the infant son of Richard Metcalf who was born and died on the same day in 1885. Soon the carving on the stone will be gone and the one concrete trace of this little life will be erased. Baby Metcalf didn’t encounter the other most likely place to leave a trace behind: in the thousands of vital statistics documents generated by the Canadian bureaucracy. As we became better at regulating ourselves and our lives we also became better at leaving traces behind. These traces are finding new life as records are digitized, indexed and made available on the web. No such luck for Baby Metcalf though. He may have been too young to warrant bureaucratic attention or his parents simply didn’t feel that involvement of officials was necessary. I think that at that time the wilderness was still a stronger force in Canada than the bureaucracy. Baby Metcalf has a new chance, however, to leave a lasting trace on this world. Genealogy societies in Ontario have been busy transcribing cemeteries for years. Now these genealogists are photographing the headstones and posting the photos online. They are also creating elaborate family trees (hypertextuality reaches it full potential in a genealogist’s hands) and posting them online for other to find and copy. A photo of Baby Metcalf’s headstone, the small (and deteriorating) trace of his life, has been added to the collection of information readily findable with the help of a search engine. It will be copied and reproduced and recirculated. Baby Metcalf now even has a wiki web page all to his own. Baby Metcalf, it seems, got lucky and has been recorded and remembered. I have to admit that I find this comforting. Why I don’t know. Mid-life, motherhood, natural inclination? Whatever it is, I take comfort in the fact that he somehow made it onto the list of things worth digitizing. Incidentally, Baby Metcalf’s parents had no other children. However, they did raise two of Baby Metcalf’s cousins whose mother had died at the age of 34 after giving birth to her tenth child. (See the record of his birth below. His brother was required to formally claim witness to the dual events of his mother’s death and brother’s birth. “I have a distinct recollection of these facts,” he claims). It’s hard not to appreciate both the powers of nature and the bureaucracy, isn’t it.